The Norton Ebook Reader supports offline reading so that you can continue to access your textbooks where normal online connectivity through WiFi or cellular service may not be available. Highlights and annotations can also be accessed offline. Yes! The newest version of the Norton Ebook Reader features the ability to read sections of your ebook offline. We currently recommend that users use Google Chrome or Apple Safari for offline reading. Other browsers have not yet been optimized for the offline ebook reading experience. You are welcome to try to use other browsers, like Firefox or Microsoft Edge, but please be advised that you may experience issues. The offline reading feature will not function when using a browser in private or incognito mode. Please make sure you launch the ebook using a standard browser window before attempting to make ebook content available for offline reading. To begin, open any chapter of your ebook. Next, click on the menu icon in the upper left corner of the page. Select the Table of Contents by clicking on the book icon and click on the Offline reading button near the bottom of the list. Select the content you would like to make available for offline reading by checking the boxes to the left of the titles. You can also use the arrows to view more detailed options when selecting content. Once you have finished selecting content, click the Apply button at the bottom of the list. Please note, the more content you select, the longer it will take to make your selection available for offline reading. If you are using a mobile device with a limited amount of storage, please be conservative with the amount of content you select. If you select more content then your device can hold, you will receive a message that only part of the content you selected could be made available for offline reading. After the content you selected has been made available for offline reading, you will receive a link that you will need to bookmark so that you can access your ebook content offline. Click here for assistance with saving a URL to a mobile device. Click on the Done button to return to the Table of Contents. 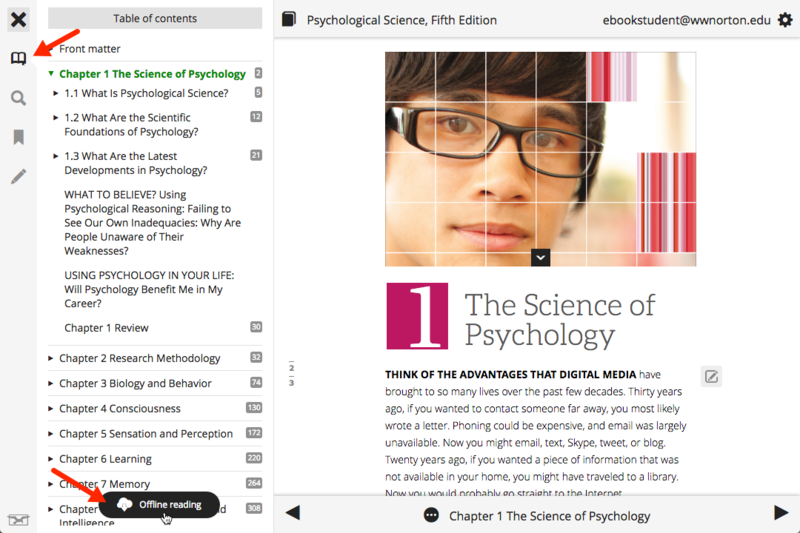 Content that is available for offline reading will be presented as bold, black text (green box). Content that is not available for offline reading will be displayed as normal, grey text (red box). The Offline reading button now confirms that you are offline (red arrow). Please note, any media (audio, video, animations, etc.) found in the ebook will only function with an active internet connection; those resources cannot be made available offline. 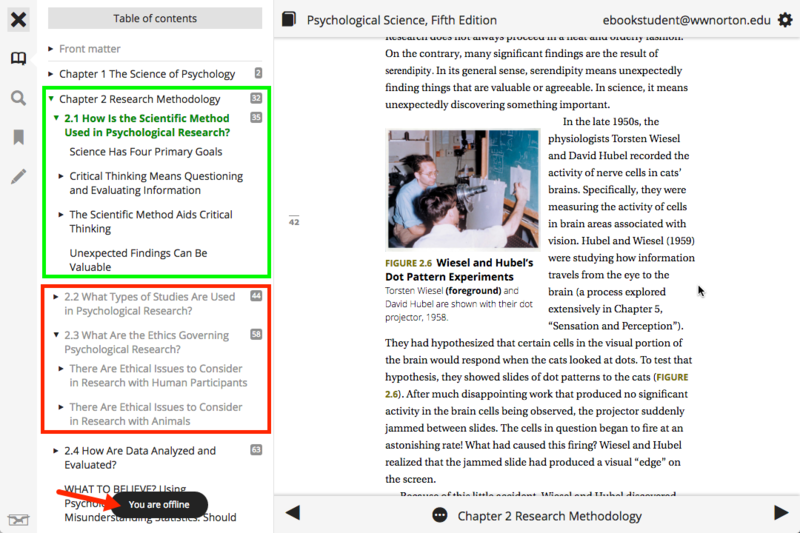 Any highlights and annotations, both personal and shared by your instructor, saved in your online ebook will be synced to your device and be accessible in the offline reader as well. The highlighting and annotation tools function exactly the same way in the offline reader as they do in the online ebook. Any changes you make to the highlights and annotations in your ebook while using the offline reader will be automatically synced to your online ebook once you reconnect to the internet and access the online ebook again using that same device. 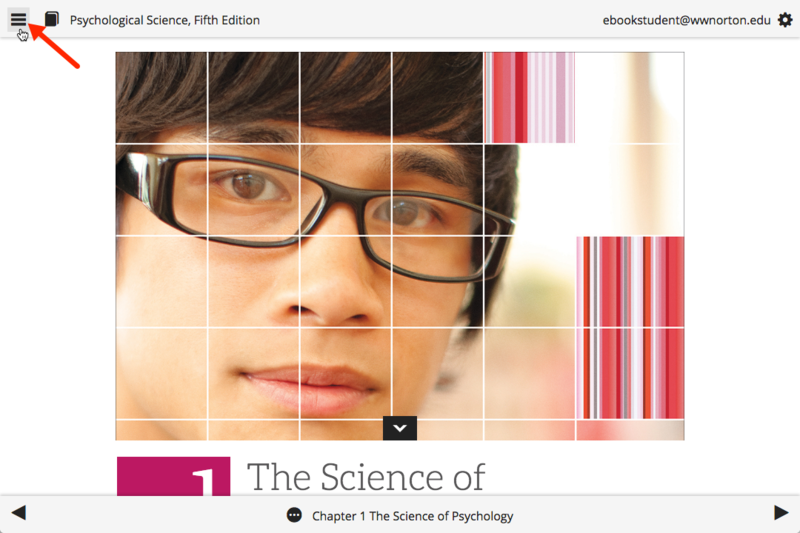 After those changes are synced to your online ebook, they will be accessible on any device. Please note, you may need to make the ebook content available for offline viewing again for those changes to appear in your offline reader; especially if you switch between devices. Parts of the ebook I previously made available offline are no longer available offline. What happened and what do I do? Norton Ebook offline reading uses storage built into internet browsers (Google Chrome and Apple Safari). This means that when you make parts of your ebook available for offline reading, you aren't actually downloading or saving anything to your computer or mobile device. Sometimes, when your browsing history is cleared, the parts of the ebook you've made available offline will be cleared and will no longer be available for offline reading. To make these sections available for offline reading again, you'll need to get back online and repeat the same process you used to make those selections available offline the first time.